Of course, there are many other tasks I’d like to complete such as knit a blanket, create a quilt from old jeans and flannel pants, convert the crib to toddler bed, see some movies, catch up on financial paperwork, etc. but I consider all these stretch goals. I have quite a long list and will consider it a success if I can check off half the items. I’m already a week into my staycation. It started off with a trip to the after hours clinic — the second time in three weeks. 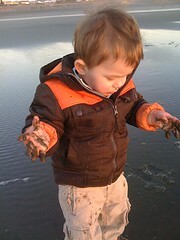 It was clear Walker had an ear infection when all the gunk drained out overnight. He was diagnosed with a ruptured eardrum and a wheeze which was treated with a week of antibiotics and doses from an inhaler. Sounds very dramatic but it’s very common for kids. But, of course, Larry and I got the cruddy cough. Despite the fact I sounded like hell and had a body-wrenching coughing fit every fifteen minutes or so, I wasn’t going to let it stop an activity-packed sabbatical. On Monday, I took Walker to Day Care and then took a very, very long walk along the beach — oh, and the first 30 minutes I chatted with a vendor about a work project. While a lot of the week was spent wrapping up a few things for work, I did it from the convenience of my new home office (check off one KPI), after walking/running/watching FIREFLY episodes (check off another KPI for week one), with the benefit of meeting-free days. Tuesday night the dryer decided to stop drying clothes and we had to take a few hours and $150 to get it fixed. All in all, it was relatively painless and inexpensive given I thought we’d have to replace our 20 year old dryer (which was predicted to last another five to ten years by the repair man who simply cleaned it to get it working again…) By 5:30 on Friday afternoon, I finished my work and could finally start my sabbatical in earnest. And yes, everyone is feeling much, much better. Tomorrow we’ll be starting the work on the garden paths. Walker had a wonderful Easter. On Saturday we colored eggs and, this morning, the Easter Bunny left a very big basket on the stoop for little Walker’s second Easter. It was filled with Barney and Elmo DVDs, a puzzle, a bunny pull toy and some sidewalk chalk. 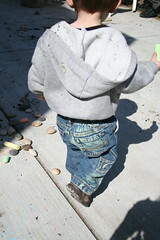 Despite all of that, Walker was more interested in Daddy’s See’s Candy Jelly Beans. Later in the day PopPop came over and we had the First Annual Easter Egg Hunt. I filled some plastic eggs with organic chocolate graham crackers and strawberry fruit chews and distributed them around the back yard. 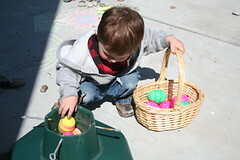 I couldn’t get the camera started fast enough — Walker saw the basket and took off around the yard collecting eggs. He was in heaven. After finding all the treasures and transferring from the Easter basket to the Christmas tree holder, we did a bit of chalk drawing. It’s also worth mentioning that it’s spring and Walker is not immune to the love in the air. 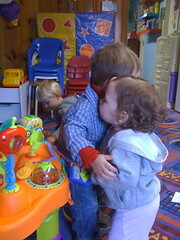 He has been smitten by a young girl at Day Care named Madeline. When we returned from a week in Florida, Walker spent the first day back at Madeline’s side, giving her hugs and kisses and returning her dropped pacifiers. 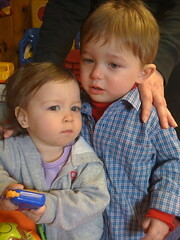 Periodically, when he awakes from his nap, he’ll run straight to Madeline’s crib and give her a hug. Apparently his love is not unrequited. Madeline follows him around as well. And what’s a blog post without a photo of Walker? When we went to Florida, we got smart and hid the shoe shine kit before Walker could destroy the brass tops. But it’s heavy and not something Gigi can move herself. So, we had to replace it before we left for the airport. Walker took the opportunity to mess with it during the very short time between moving it and going to the airport — you can tell we’re on our way soon since Walker was donning his backpack filled with toy. And of course, all the girls love Walker… Need I say more? Walker would like to take a moment to thank the wonderful Hunt family for the fantastic train set and play area. It’s the first thing he plays with in the morning and the last thing he plays with in the afternoon. Mommy and Daddy spend a lot of time fixing the tracks after Walker does his rampaging play fun through the Village but we enjoy it as well. 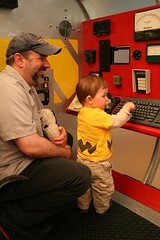 He especially enjoys the magnets and jamming train parts into the large Fire House. That was second only to opening and closing the Fire House doors that would turn on the flashing lights and loud siren. Mommy and Daddy turned off that feature quite quickly. Thank you Simon, Susan, Ian, Devin and Megan. 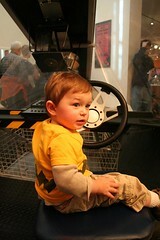 Walker appreciates the toys; Mommy and Daddy appreciate the ability to sit on the couch and watch him have fun. How much CO2 have you saved? Hooray! Today our little house began to be a more green place to live. Our solar system went online and we saved about four pounds of carbon dioxide in the last two hours of sunlight of the day. It was very exciting to see the electric meter spin backwards and know PG&E can pump a bit less crud into the air because of us. We look forward to smaller bills. I don’t think it’s related but Walker sang a wonderful rendition of “Yeah Mama!” tonight while he was falling asleep. Here’s to a better life for our kids. Posted on March 18, 2009 June 30, 2017 Author mimzillaCategories One more thing2 Comments on How much CO2 have you saved? 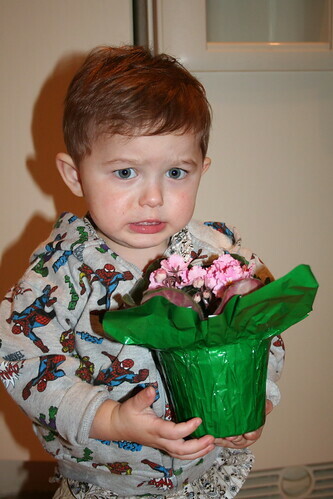 Walker went to the store and picked out this plant all by himself. He carried it through the store, to the register, back to the car, and all the way home so he could ensure it arrived safely. He’s very sincere in his good wishes (as evidenced by his expression.) Happy Birthday Gigi. We love you. Today I had occasion to reconnect with three people who were instrumental in molding my career — my friends Jeff Veen (user experience God), Bryan Mason (organizational wizard), and Maggie Mason (Mighty blogger and writer). I’ve always admired this trio and they’ve each inspired me in different ways. Jeff has an incredible way of looking at the web and making complex things simple. Bryan knows EVERYONE and uses his energy to bring everyone together to work towards a common goal (which is generally for something that betters the world in some way — and did I mention we share a passion for solving problems?) Maggie is one of the most entertaining writers I know, and, coincidentally, she’s mommy to a little boy who just turned two so her writing has recently veered towards the Mommy-centric. I credit Maggie for giving me the confidence to write in a public forum so you can thank (or curse) her for this blog. (You may recall an earlier post where I described my early writing process that involved many tears and bottles of wine.) Anyway, I’ve been so very busy and single-minded that I’ve neglected to spend the time with people who are doing fascinating and progressive projects that get me to think differently. I doubt they realize what a huge impact they’ve had on me and my career but with the magic of the Internet, I’m sure they’ll soon find out. So thank you my friends and it was great to see you. A few other things have happened recently. 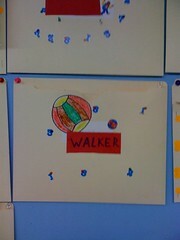 Walker has continued to CREATE at school. He’s doing a lot more drawing and I continue to be impressed at how well he colors in the lines. Some of his projects have included cut outs and tape. Today I brought home a large cut out bunny that was stapled to a brown piece of paper rolled in a tube so it’s sort of like a Bunny on a Stick. All these projects have been stored in Walker’s new folder that hangs on the wall at school. It’s so exciting to walk in to Sofiya’s and check his folder for the latest creation. And how do we get all these items home? 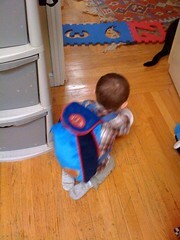 Sofiya suggested Walker was old enough for a little backpack. Boy, was she right! On Sunday we went to the toy store in search of something — I had been hoping for a small bag with some astronauts and rockets on it but we had to settle for a blue bag with a generic “Football U” on it (I’ll be sewing some space patches over the existing embroidery). Who cares what I like? Certainly not Walker because the pack is his new favorite possession. 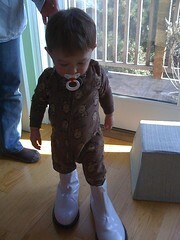 Each morning, when we get ready to go, we put on shoes, pick out our favorite coat of the day, and put on our backpack. He’s so proud of himself and feels like such a big boy that I think he’s an inch taller by the time we walk out the door. Speaking of big-boy, last night we refinanced our house (again — we got an amazing rate so there’s one benefit to the economic “downturn”). Walker was very patient but really wanted to be a part of the process. For those of you who haven’t been through this, you must know you have to sign and initial about 100 documents. And both of you must do it. Walker wasn’t going to let us have all the fun; he very much wanted to assume some of his own debt. So he sat down at the kitchen table with Mommy, Daddy and Notary, took his pen and started signing loan papers. The Notary was quick to accommodate his desires, giving him some of his very own pages with check marks, “x” marks, stamps, and signature lines. Thirty years from now, I’m sure he’ll be thrilled to know we considered him “Borrower #3”. And I’ll end with one comment. Walker has given Wilson another nickname. The cat once known as WillyBean, Beano, Mr. Bean and Mr. Three Fang is now affectionately known as “Rwaow.” The large kitty doesn’t “meow” like most cats but rather, he has a more guttural “rwaow” and he likes to talk. Yeah, that nickname is gonna stick. I got to Sofiya’s today and something new happened. She gave me a project Walker did at school. 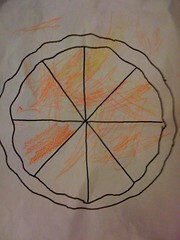 (He colored a picture of a pizza with orange and yellow crayon.) It was so wonderful, I almost cried. It’s not that it’s his best work ever — you should see the awesome Valentine’s Day cards he made with crayon, pen, and marker — but it’s his FIRST school project. You see, all the big kids have folders on the wall and each day, there are projects in the folder waiting for the parents to take home (pictures, masks, and other crazy things). Walker adores to draw. It’s been his favorite activity the last few weeks. Many times throughout the day, he’ll go to the table and pat his highchair and demand his crayons and paper. We have a plethora of paper options to choose from including tablets, notebooks, cards, letters, instruction manuals or whatever else he can find. He’ll sit for long spans of time and scribble away. He’ll make small lines, big circles, soft and hard scribbles. 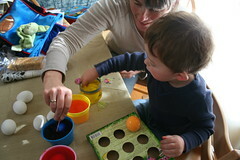 Most of the time he uses his right hand but sometimes, he’ll put crayons in both hands and go to town. I love watching him. He’s so focused and when he does something he likes, he picks it up and shows me. (He demands I sit next to him.) I’ve even found he likes to draw in the car! I don’t have a lot of experience with kids so I think this behavior is normal for a kid his age. But today Sofiya was so very impressed. She couldn’t believe how well he did all by himself. He’s going to get a folder on the wall with his name on it. I think I’m going to cry all over again. Monday was President’s Day and Day Care was closed. Sofiya didn’t decide she was going to close until the end of the week so I didn’t find out until after 5 on Friday. (All the kids are sick including Walker who has a sinus/ear infection, and I think she needed the rest from all those runny noses.) Not having back up care, I made Walker my apprentice for the day. Our first stop was our financial adviser. He was an angel. He played with his blocks and he colored and he ate goldfish crackers. He had the run of the office and was the perfect gentleman. Our next stop was the Adobe office. He played blocks with some of my co-workers, colored on my white board, ran up and down the cube rows, sang, jumped and danced. He joined me for four meetings. During one, we sat on the floor and ate yogurt. During another, he jammed grilled cheese in his snack cup, smeared a dirty whiteboard eraser across a wall, and took everything out of my wallet multiple times. He also would yell “Mama!” or “Ssssshhh. 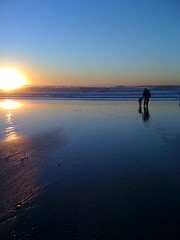 Quiet!” at opportune moments. (I was terribly impressed at how well everyone focused on the meeting despite my apprentice’s activities.) He napped during the third meeting. For the fourth meeting, we were at home. He was a bit less patient and despite playing with Daddy, he spent a lot of time grabbing my hand and bringing me into the living room to watch him climb on furniture, knock down block temples, or run down the hallway. He is perfect. I’m so proud of him. Walker loves to move things from one place to another. He also likes hats. 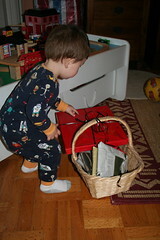 On Christmas Day, the little munchkin combined his two passions and put a wicker trash can on his head and walked around with his new box of books. Walker had logged some considerable time with the basket on his head and impressively avoided all barriers but he had not tried carrying anything while donning his very special hat. It was certainly video-worthy. Yesterday, Walker and I went on an errand to a knitting store. He was in heaven — a store filled with small boxes of soft things. He spent the next 30 minutes taking yarn from a cubbie hole, going up the step to the next room and putting the yarn in a box. He’d then repeat the process. After about 10 minutes, he worked up to removing two skeins at a time. I wasn’t able to get my yarn because I was getting my own exercise returning the yarn to the correct location. Finally, he decided to remove an entire cubbie of yarn at once. “It’s a good thing he’s cute,” I heard one employee say. We promptly left. Next time, I’ll go to the store by myself. Thanks to everyone who has been so very supportive over the last week. 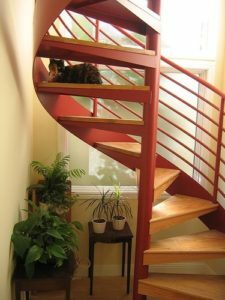 Without Moxie, the house feels a little emptier and Wilson is a bit more attentive but it was time for Moxie’s next adventure — whatever that may be. We choose to think of her purring on Mom’s lap. Moxie was a simple cat. She had one mission and that was to LOVE. But she didn’t love just anyone — you had to be part of an exclusive club, a FOM (Friend of Moxie). She came into our lives when she was eight. Mommy wanted a cat and we went to Pets Unlimited. We met Moxie and they immediately bonded. The next few years were filled with much snuggling between Mom and Moxie who would have nothing to do with anyone else. Whenever I would come over, she would hide under the bed. A few years ago, Mom moved and couldn’t take Moxie with her. So she came to live with us. She was so very shy and was overwhelmed by a big house, two people and a new kitty friend, Wilson. She decided to spend almost a week under the office floor as a way to adjust to her new surroundings. She finally committed to her new home and she flourished. She made new friends and spent her days in the sun (when she wasn’t hiding in the closet from the housekeepers or the construction workers). Her favorite place in the whole world was curled up next to (or on) me or Larry. Her next favorite spot was hanging out on the spiral staircase in the sunshine. She was a bit wary of the small child who chased after her and yelled in her face. She and Wilson shared my affection and would alternate between fighting, snuggling, and ignoring each other. Today it was clear that Moxie was unhappy and she was no longer going to fulfill her mission — to personify love. Moxie loved us and exerted her peronality to the end and we are grateful we had the opportunity to bask in her glow. Larry made a nice dinner. I’ve had a few glasses of wine. There is no ice cream in the house. I’m hugging Larry, Walker, and Wilson. She is with Mommy and that, more than anything, makes me feel more connected to them both. It’s hard enough to lose a pet but Moxie was Mommy’s cat. I have a lot of baggage around this so this ordeal has been particularly difficult. I’ve been joking that I have so much baggage I need a Bell Hop to deal with it all. With all of this drama, it makes me appreciate all my family, friends, and colleagues so much more. Thanks to you all. It’s all the cycle of life. I didn’t understand it like I do now. 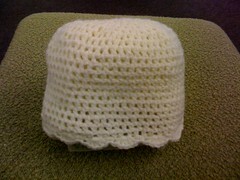 I have a big mushy center. Don’t tell anyone. I’m going to go find some chocolate and watch LOST. Oh, and drink some more wine. Who needs a new diaper? Larry and I have spent the weekend asking him questions in the hope that he says, “I do!” It’s just too darn cute. He’s also started straddling the chair arm and riding it like a horse and singing “Dum de dum dum. Dum dee dee dumm dumm.” Oh, and he’s putting words together. He waved and said “Bye Bye Da da” when we went off to Sofiya’s on Friday. Good weekend. Yesterday was a long day. 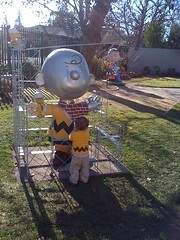 We took a day trip to Santa Rosa and visited the Charles M. Schultz Museum. It was one of those infrequent intersections of Larry / Mimi passions. 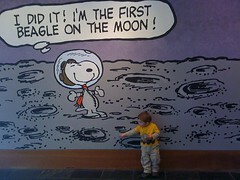 I’m a big fan of the Peanuts and, of course, Larry is a space geek. It’s the 40th anniversary of the Apollo 10 mission (I was born right in the middle of it) and the ships were nicknamed “Snoopy” and “Charlie Brown.” The museum has an exhibit celebrating the mission and Snoopy’s support of NASA’s space program and yesterday was opening day. Two of the Apollo 10 astronauts were there to kick it off. Walker and I bumped into Gene Cernan, Apollo 10 astronaut and last man on the moon. Very cool. He’s a well-dressed man. It’s also cool that one of our friends collects space artifacts and he loaned them to the museum for the exhibit — pieces of the actual NASA Mission Control panels and a page from a flown Flight Manual signed by Buzz Aldrin (with an associated letter showing provenance). 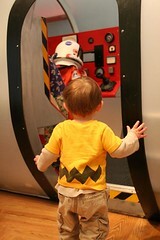 Walker had a great time and we took lots and lots of photos of him in his Charlie Brown shirt. I also had to bring my Snoopy for the festivities. He’s 32 years old and has been through a lot. He even went into surgery with me when I got my tonsils out. The doctors were so impressed he was wearing his surgeon’s scrubs that they let me have him until I couldn’t count backwards any more. The little man has also decided he knows the best way to show affection. He gives lots and lots of kisses… but everyone does that. He’s decided he’s going to bite my nose. (Did I mention he’s got 18 teeth now? His canines are in now so he’s just missing just his last four molars.) When he’s really feeling punchy after a bath, he opens wide and leans in. He goes in for the bite. Chomp! He locks on to my nose and giggles and giggles. Periodically he decides to mix it up and he dodges to one side. Mouth wide, he gets a vacuum on my cheek and blows making farty noises. He’s such a boy. He’s also learned a new page in his “Big and Little” book. Not only does he read the pages that say “ooops,” “uh oh” and he hides his eyes on the “I can’t look” pages, but now he very clearly says, “Oh My!” I’ll tell you I was more than shocked when he did it the first time. He’s trying to read the “Splash” and “Tah Da!” pages. He kinda voices the inflection rather than the words. He does this with “thank you” as well. Larry and I are the only ones who can tell that’s what he’s saying but as far as I’m concerned, it counts. Global warming is a terrible thing but we’re trying to enjoy the by-product — a warm and clear winter making for lots of fun on the beach and incredible sunsets. Posted on February 1, 2009 June 30, 2017 Author mimzillaCategories One more thing1 Comment on Who needs a new diaper?